Is the smallest insulation diagnosis set on the market. 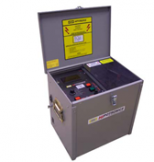 The weight of only 25 kg / 55 lbs Ideal for tan delta and capacitance testing. Hipotronics OC Series. reliably test the dielectric strength of insulating liquids. 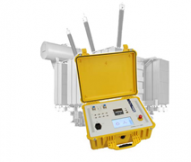 Lightweight, portable design, Rugged and reliable, Output voltages to 60 kV or 90 kV, Tests insulating oils per ASTM and IEC specifications, Automatic HV shutdown at breakdown, Digital memory kilovoltmeter, One piece construction with safety interlocked HV section. Meter Accuracy : ± 2% F.S. 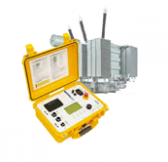 The 2293 is an automatic winding analyzer, optimized for three phase power and distribution transformer measurements. A simple one-time-connect-all system drastically reduces measuring time: once connected all tests can be done in a row without any reconnection. Multipurpose winding analyzer: transformer winding resistance, turns ratio, demagnetisation, type detection and heat run test (cooling curve) in one instrument. Fully automated measurement of turns ratio, voltage ratio, phase displacement, and excitation current. Tettex 2796 Transformer Turns Ratio Meter. Highest accuracy up to 0,03%. The higher test voltage of 250V together with the high precision assures authentic results especially on large power transformers. Measures output voltage, leakage current, insulation resistance (IR), and polarization index (PI) Adjustable test parameters such as target voltage, maximum leakage, ramp rate, and dwell time. Recorded test results and data transfer via USB 2.0 7” color, touch screen display with adjustable brightness. The HVT-DI Digital Controller has an intuitive, user-friendly interface displayed on a large 7-inch color touchscreen. HVT-Series AC Hipot users can now preset hipot tests in Automatic mode or simply control the test voltage using Manual mode. The HVT-DI Digital Controller is also equipped with data acquisition software for exporting test results via USB.